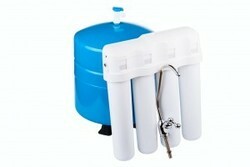 Manufacturer of a wide range of products which include water purifier systems. Known for our credibility in the market, we are engaged in providing a premium quality range of Water Purifier Systems. The offered water purifier aims to provide safe and healthy water for drinking by eradicating the dissolved impurities like rust, chemicals, and pesticides from the water, while retaining the essential minerals. This system is known for its attributes like easy installation, reliability, and efficient working. The product goes through the stringent quality check before reaching the market. Furthermore, we provide this product at market leading price. Storage Capacity - 8 lits. Table Top & Wall Hung Model.